Learn more about the new Custom Match feature making its way to Battlegrounds. With the recent Month 1 Update, PlayerUnknown’s Battlegrounds now has both a test server and a feature where players can create a custom match. The custom match feature is one of the most requested additions (aside from balancing, FPS, and reduced lag). Below, we’ve listed everything we currently know about how to join and create a custom match in PlayerUnknown’s Battlegrounds. Note: This guide is a work-in-progress. The new custom match feature in PlayerUnknown's Battlegrounds. This will let you view a list of custom matches created by other players, developers, and PUBG partners. In the title of each custom match, you can get an idea of the unique game parameters. If a custom match is open and doesn't require a password (no lock symbol on the right), click on it to enter into the custom match. Note that if the match has already started, you won't be able to join that custom match. 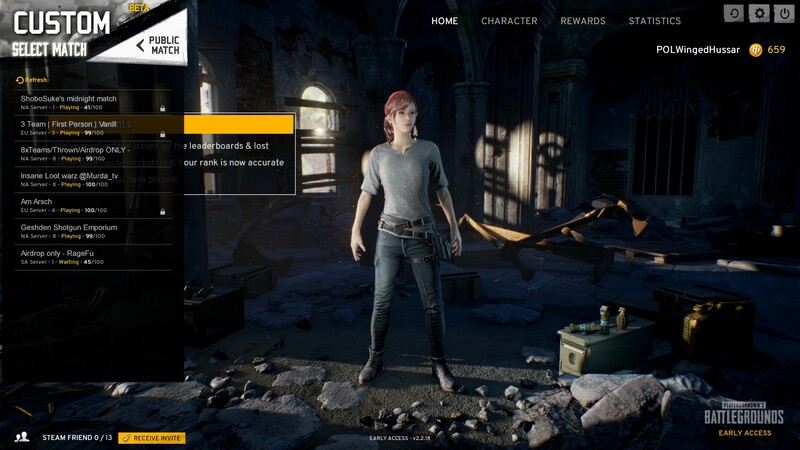 If you're looking to create your own custom match, you will have to wait until the feature is fully introduced for all Battlegrounds members (not just devs and PUBG partners). Custom match parameters can include everything from altering the weather to first-person only modes. When Battlegrounds’ custom match feature becomes fully accessible for all players, we’ll update this guide on how to set up different match parameters. Until then, be sure to check Battlegrounds to see if the custom match feature is up and running. What custom match are you hoping to create in Battlegrounds? Let us know in the comments below, and we’ll give them a try once the custom match feature is up! By reading this guide, you should now know how to join and create a custom match in PlayerUnknown’s Battlegrounds.